My mama lent me The Mermaid Chair a couple months ago, Oh, take this one too, it’s fine, it’s you know, just fluff. 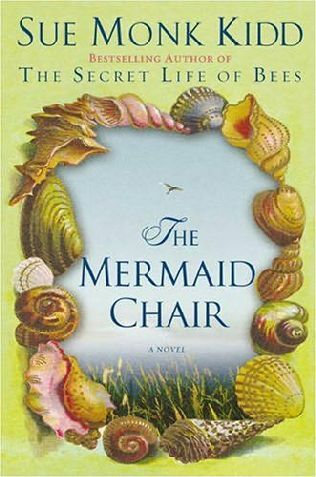 The Mermaid Chair is by Sue Monk Kidd, the author of The Secret Lives of Bees. It takes place on an island off South Carolina, where Jessie Sullivan, a 44-year-old mother and wife, returns home to take care of her crazy ultra-catholic mother and falls in love with a Benedictine monk. The book feels a wee bit cheesy to me…but maybe that’s just because I don’t really believe in love at first sight? Like how can they be soooo in love to consider giving up a 20-year marriage on Jessie’s side, and a vow to God on Brother Thomas’ in just a couple weeks??? What can I say, I’m a skeptic and I have my doubts. The context is kind of fun – it’s a southern island, where one woman speaks Gullah, and they’re constantly eating gumbo. I picture a combination of Misty of Chincoteague, The Legend of Bagger Vance, and Gullah Gullah Island (do you remember that Nickelodeon show? It was on when I was in about 3rd grade). Anywho, bottom line? Read it if you want - it’s fluff. Read a more in-depth plot summary and review here. Here's a Reading Guide and Discussion Questions. Oh no – it looks like it was made into an incredibly cheesy movie!